In many ways, nurturing seedlings is a lot like parenting. It requires love, attentiveness, and lots of patience (a good sense of humor doesn't hurt either). To keep your seedlings healthy, you need to learn to recognize when they are sick. Here are eight signs your seeds are in trouble and what may be causing it. 1. Seeds fail to germinate. Temperature is too hot or too cold. 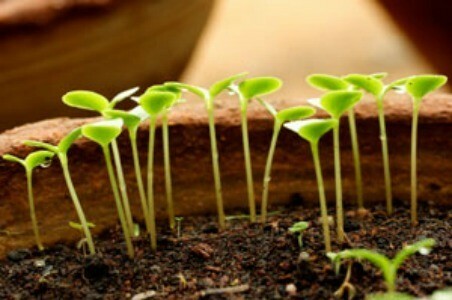 Seeds are planted too deeply or not deeply enough (they may need more contact with soil). Your growing medium was allowed to dry out. The seeds are old or improperly stored. Damping off disease (seeds rotted in soil). Improper light (some seeds require light or darkness to germinate). 2. Seedlings fall over or start to decay at soil level. This may be a sign of damping off disease (organisms attacking seeds and young plants). Once plants have been afflicted, reviving them is not possible. Stress from low light or cool temperatures. 3. Leaves start to curl under. 4. Growth appears stunted or dwarfed. 5. Seedlings have pale, or discolored leaves. 6. Seedlings have leggy, spindly growth. 7. Seedlings have poorly developed roots (as seen when transplanting). Compacted soil (lack of air space in growing medium). 8. Moss or mold is taking over your growing medium. I am so glad this was on your site! I am just getting ready to plant some seeds and have no idea what I am doing! Thanks again! What if the the leaves start curling up? They look pretty pale too. My first plant. Great info. I planted so many seeds and most of the seedlings died. With this information, I should have a better success rate this year.